Charlie Gordon knows that he isn't very bright. At 32, he mops floors in a bakery and earns just enough to get by. Three evenings a week, he studies at a center for retarded adults. But all of this is about to change for Charlie. As part of a daring experiment, doctors are going to perform surgery on Charlie's brain. They hope the operation and special medication will increase his intelligence, just as it has for the laboratory mouse, Algernon. Meanwhile, each day Charlie keeps a diary of what is happening to him. This is his poignant record of the startling changes in his mind and his life. 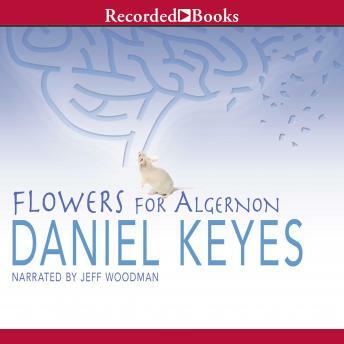 Flowers for Algernon was first published as a short story, but soon received wide acclaim as it appeared in anthologies, as a television special, and as an award-winning motion picture, Charly. In its final, expanded form, this haunting story won the Nebula Award for the Best Novel of the Year. Through Jeff Woodman's narration, now it becomes an unforgettable audio experience. This was my first audio book and was very impressed. The story was one that makes you think. I thought it was very good.